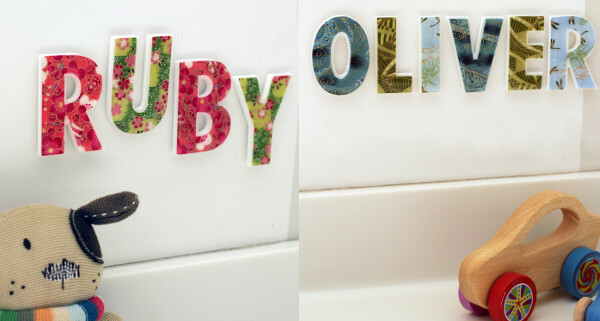 Are you looking for something a bit different to run-of-the-mill wooden letters to personalise a special room? So was one of our team, Sally, and she found them at Mooza Designs. There’s not a teddy bear or clown to be found on these sleek tiles, and a range of designs mean there’s sure to be something that tickles your fancy. 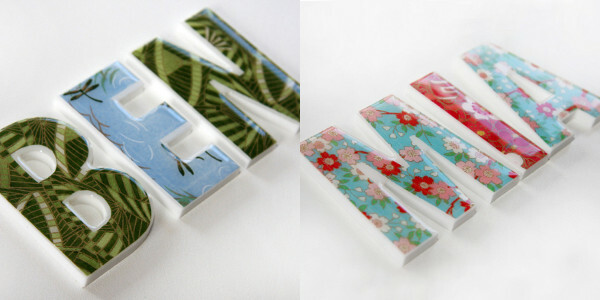 The letters look ceramic but actually have an acrylic base, which makes them lightweight (and harder to break!). On top of that base comes gorgeous Japanese paper in a variety of designs, and the whole thing is finished off with a resin coating – giving it a high gloss, stylish finish. The tiles are $9 each and will attach easily to any smooth surface with Blu Tac or similar. The team at Mooza can put together any custom word for you, and with more than twenty co-ordinating designs, the hardest part will be which colours to choose. If you’re in Sydney, you can go and check out their range in person at Paddington Markets – but for the rest of us, you can find it all at Etsy.